KlezKanada's Laurentian Retreat - Monday, August 21 - Sunday, August 27, 2017. Click here to open the KlezKanada 2017 registration form. If you have not yet registered, please do so here, as soon as possible. Reserve your place now before we fill up! Scholarship applications are now open for emerging artists and scholars, ages 16 to 35. This internationally renowned program offers students an opportunity to study with many of the leading teachers of Yiddish/Jewish music and culture, and make friends and form artistic partnerships that will last a lifetime. Apply here. One of the delights of this year's KlezKanada was the first-time appearance of poet Seymour Mayne. He has written this appreciation. KlezKanada in just a week and a half, Aug 16-22—last chance to register? I woke up this morning realizing that I am just a bit over a week from KlezKanada. The approach has been manifesting itself in several ways—earlier this week, for instance, I was planning my get together with friends at a houseparty in Maine. "Looking forward to klezmer" wrote my friend. For a moment, I was in a panic since we were about to hear a singer-songwriter of the Grateful Dead persuasion with no connection to Jewish music (other than personal ancestry). Then I remembered that we were all meeting up soon--him, his wife, his song, and his inlaws. It isn't such a stretch when you consider that KlezKanada alumni Shtreiml played my friend's Montreal wedding. This is going to be an incredibly exciting KlezKanada. Not only will I be there doing the usual daily Yiddish/English/other-languages-as-present newsletter, but the entire "Other Europeans" ensemble will be teaching—a unique opportunity to learn older European klezmer traditions, but also lautari (Roma musicians) traditions. There will be a host of other incredible music workshops, along with some very exciting lectures and presentations. Consider this, then, your last opportunity to register, and come visit with us in a little over a week, in beautiful Camp Bnai Brith in the Laurentians, just north of Montreal. Register online now for KlezKanada 2010! KlezKanada 2010, Aug 16-22 - Registration now open! Register now for KlezKanada 2010! KlezKanada is preparing for its 15th year! We are in the midst of finalizing our 2010 faculty and creating a week of world-class programming. Each year we present an incredibly talented faculty and exciting new programming while still ensuring the atmosphere you love. This year is no exception—our program highlights this year are truly not to be missed! KlezKanada 2009 Full Brochure Now Available for Download! We have an unbelievably exciting, diverse program planned. Read the brochure, share it with your friends and family, and then come to KlezKanada 2009! See you there! Here's the thing. If you look at the young people doing exciting Jewish music, a huge number, from Michael Winograd, Sarah Gordon, Dan Blacksberg, Kinneret Sagee, Joey Weisenberg, Lorie Wolf, Rachel Lemisch, Josh Dolgin, and Eric Stein are KlezKanada alumni. How does one week at a Bnai Brith summer camp have so much influence? I think it is the balance between incredible traditional programming, lots of people happy to push boundaries and try new things, and the physical space to explore. Or, it could just be that the nicest people show up and what else could happen exciting music and culture? I'll be there, documenting it as best I can in the daily, multilingual newsletter. See you there! 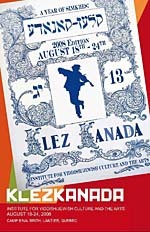 Just a quick note to remind people that registration is now open for KlezKanada 2009. The camp runs from Aug 24-30 this year. Because finances are so tight, early, even timely registration is especially important. And of course, if you don't register before camp fills up, you'll miss seeing your friends, not to mention familiar faces such as mine. You can register for KlezKanada online, even. See you there! Announcing Winter KlezKanada at the Ben Weider J.C.C. Musicians! Counting the days until KlezKanada 2009? Don't wait for the warm weather to brush up on your D Freygish and join us for the WInter K.K. ensemble. Come out and play Klezmer repertoire with other musicians with the guidance of Klezkanada Faculty member Rachel Lemisch. Learn the Freylach, Hora and bulgar, as well as improvisation in a Jewish style. All instrumentalists aged 14 and up welcome. Emphasis will be on jamming and performing. Semester will culminate in a concert. Further info at www.klezkanada.org/index.php/calendar/1-2-1|1-21438.html, or email Rachel Lemisch. Note only are the scholarship applications online, but the application can actually be filled out online. I look forward to seeing new and familiar faces this coming summer! The man with the camera eye, Bob Blacksberg uploaded a heap of photos, and you'll find others from anyone who uploaded to flickr.com and remembered to tag them, "klezkanada08". Enjoy! This is a Flickr badge showing public items from Flickr tagged with klezkanada08. Make your own badge here. There will be hundreds more, plus video, as I get the chance to work on it. I will try to post full resolution versions of the group pictures in the next day or two, and perhaps select different ones than those that appear here. I can barely find the words to express the learning, joy, khevre, affection of this week. I hope the pictures help to capture it. If you would like to send a caption or description for any of these pictures, or others that I post, please write. I will add them to the web pages to enrich the experience for all. [article seems to have disappeared! Keith Wolzinger pointed this out to me: "Fresh country air for old-world klezmer", by Irwin Block, in this past Sunday's Montreal Gazette.